We know that high intensity muscle overload is the key to building new muscle. But how do you know if today’s chest exercise really has a higher intensity than last week’s chest exercise? If you train the way most people do, you can’t know for sure. The same is true for every major muscle group of your body. But there is a way. The Power Factor number allows you to see each muscle’s intensity. The Power Index number allows you to see how far you went at that intensity. These two measurements, used together properly like a speedometer and an odometer, are what allow you to deliver unprecedented power, endurance and size gains to your muscles. I’ve worked for years to create brief, efficient workouts. But I’ve heard from many people who tell me they don’t care as much about quick workouts as they do about building more muscle power, endurance and gaining as much muscle size as possible. Even if that means longer workouts or more trips to the gym. The Power Factor Workout is the answer to people who need – or just want! – more volume in their training. It is the first rational, measured workout designed to give you bigger muscles with maximum sustained power and functional endurance. It’s easy to create a high-volume workout, you just throw every exercise plus the kitchen sink into the program. Trainers tell people to do three or four different exercises for each muscle, three or four sets for each exercise and to keep coming back every few days to repeat all of it. The obvious result is people burn out because those programs are not sustainable. That always becomes obvious. But the invisible problem is their intensity is not high enough to trigger the real power, endurance and size gains they seek. The Power Factor Workout solves both problems by balancing your performance on the fine line of true high-intensity of output for specified length of time that does not allow the intensity to drop off into the useless zone. That is the holy grail of power/endurance training; working muscles as hard as you can for as long as you can without overtraining. It’s crazy to do that blindly when the Power Factor Workout gives you a simple, easy way to monitor both things and clearly see your performance. This Power Factor Workout builds power, endurance and size in ten major muscle groups. It monitors two critical parameters for each. That’s twenty measurements. How can anyone believe that he or she can visit the gym and “feel” that while his triceps power/endurance is up 12% his lats are down 6% in peak intensity and even more in power/endurance? So his triceps are progressing but he’s overtraining his lats – without measurements he’s not aware of either fact. So he’ll plod along until his performance is so lopsided and he is in such an overtrained state he has no hope of reaching his goals no matter how often he trains or what nutritional supplement he gets talked into trying. Sound familiar? The following three principles are not controversial, they are well-settled principles that have caused humans to grow muscle for thousands of years. If you obey all three principles every workout you will make incremental gains in muscle strength and size every workout. If you’ve read anything about weightlifting you’ve come across the term “high intensity.” Many books have been written with those words in the title and uncounted magazine and web articles are the same. It’s a valid concept that states muscle growth must be stimulated by a high intensity of output. That’s why we lift weights – to create a load for our muscles. When muscles are forced to work at a high intensity of output they signal the brain to grow more muscle tissue. Want to hear the biggest mistake in conventional High Intensity Training? There is no measurement! None. All of those people who talk about the intensity of an exercise do not have a unit of measure. The intensity of sound is measured in decibels, the intensity of light is measured in lumens, there are many different units of intensity in science. In 1992 I innovated two measurements of the intensity of muscular output, the Power Factor and Power Index. When you have a meaningful measurement of the intensity of every exercise you perform it means you can spot progress, plateaus and regression from day one. That absolutely guarantees the first principle is respected – true high intensity overload. The second principle is that the overload must be progressive from workout to workout in order to keep growing. If the progression stops, the muscle growth stops. If you lift at the same intensity of overload on every workout there is no reason for your body to grow new muscle. The wrong way to train is to never know exactly what the overload is on each exercise from workout to workout. That’s called training blindly. And that’s just crazy. The smart way to train is to know the percentage of increase you achieved on each exercise last workout and what goal weight would be appropriate for today’s workout. That absolutely guarantees the second principle is respected – true progressive overload. When your body is subjected to any stress its first priority is always to recover. When we do an intense workout many waste products are created in the body and they need to be processed and expelled. That takes time. Only after that process is complete will the body spend its energy building new muscle tissue. It’s also easy to understand that a very light and easy workout would require less recovery time than an very intense and difficult workout. In addition, your level or conditioning affects recovery time. So does the amount of general stress in your life outside the gym. In fact there are quite a few things that can affect the time it takes your body to fully recover. So the wrong thing to do would be a fixed training schedule (such as, ‘three times a week’) that required you to do a workout irrespective of the (1) high intensity of your last workout (2) the amount of progression (or lack of) on your last workout and (3) that your full recovery had not yet occurred. The smart way to train would be to constantly monitor your exact progress with a meaningful measurement of your progression from workout to workout to see how long full recovery – and new personal records – take to achieve. In the beginning of training this can be only two days or so, but as you get stronger and the intensity of your workouts progress your body will need more time between workouts – and your numbers will prove how long you personally need under your circumstances. That’s the smart way to absolutely guarantee the third principle is respected – true full recovery before the next workout. The Power Factor Workout is not a rehash of what you hear in the gym and read in books, magazines and online forums. It is based on years of innovation and experimentation that led to a better way to train. And these aren’t principles I’ve just worked out “on paper.” These are principles proven in the gym by over 200,000 bodybuilders, athletes and just regular folks from all over the world since 1992. The Power Factor Workout is absolutely loaded with new, useful information you can apply in your very next workout. You spend hundreds of dollars to join a gym or to buy your own equipment. You probably spend hundreds on healthy food or nutritional supplements to prepare your body for building new muscle…but you can not make consistent, productive muscle gains without a proper training method. Why subject yourself to the wear and tear of blind workouts week after week and month after month with little or no improvement? Why perform even one more unproductive workout? Don’t throw away another dollar driving to the gym to do a useless workout or gulping down a supplement that can’t help you if you haven’t stimulated muscle growth in the first place. Without measurement nothing can be called a science. To show you what I mean here is an example of two typical bench press workouts. So, was Friday’s workout with 5 lbs extra on the bar progressively more intense and than Monday’s workout and did it therefore stimulate new muscle growth? Nope. The intensity was down 3% which means you were not as strong on Friday as you were the Monday before – which means you were not fully recovered. More to the point, you did not stimulate new muscle growth. Oops. A wasted trip to the gym. Again. In fact it’s worse than just wasted. It means you now need even more time to recover because you just dug a bigger hole for your body to get out of. See why people are frustrated and confused about why they aren’t getting the results they are working so hard for? This is exactly the wrong way 99% of the people in your gym train. The smart way to train is to eliminate unnecessary blindness and replace it with clear benchmarks. Don’t be intimidated by all this talk of measurements. It’s all done automatically for you. All you need to write down is the weight you lifted and the number of reps you performed in the specified time. You enter 185 lbs and 43 reps into the spreadsheet and it does all the calculations and graph making for you. Then you see in an instant how you really performed on each exercise. Below are the two graphs you will see for your chest exercise performance. 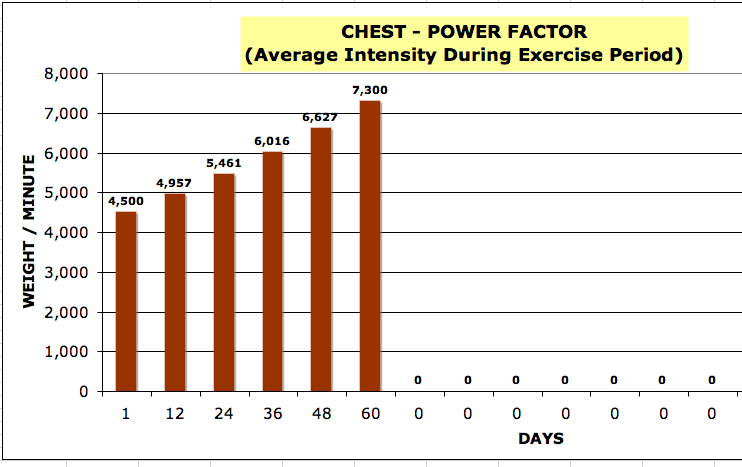 On the left is the graph showing the Power Factor (momentary intensity) for the first six chest workouts. 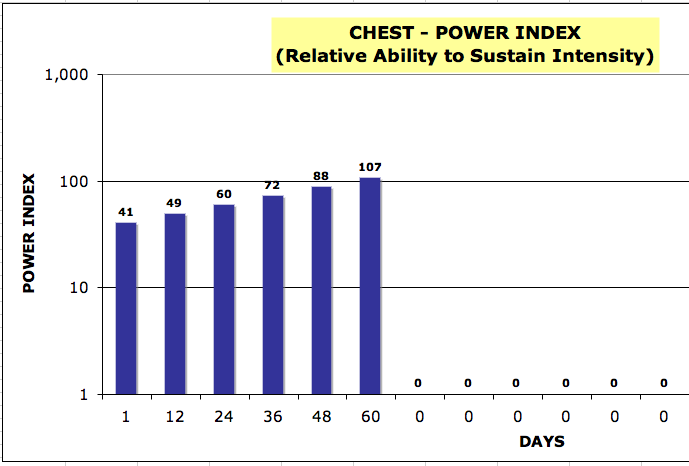 On the right is the graph showing the Power Index (sustained intensity) for the same six chest workouts. 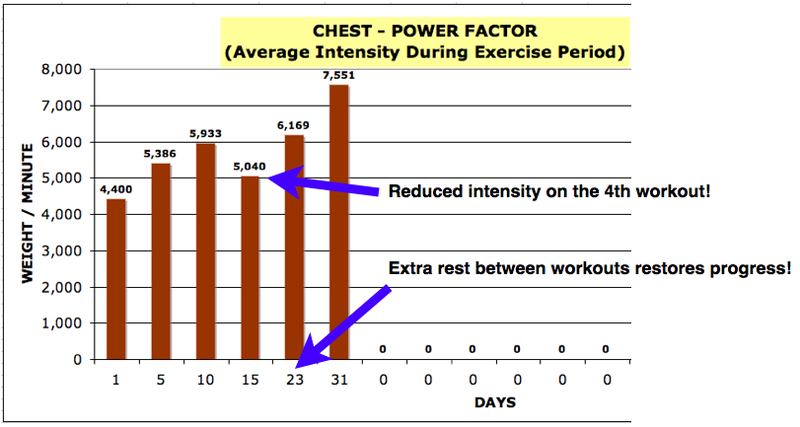 On this graph you can immediately see that the 4th chest workout performance was less than the previous workout. The Power Factor dropped from 5,933 lbs/min to 5,040 lbs/min. Why? Did the trainee’s muscle disappear in 5 days? Did his chest wither? Of course not, he just wasn’t fully recovered from his previous workout. When he added extra rest days between his workouts his progress resumed. Look at what you are seeing here in graphic detail! 1) High intensity, measured on the left axis. 2) Progressive overload, seen on the lengthening bars. 3) Adjustable training frequency, seen on the bottom axis. And it’s brilliantly simple because you just enter your weight and reps and let the spreadsheet do the rest. 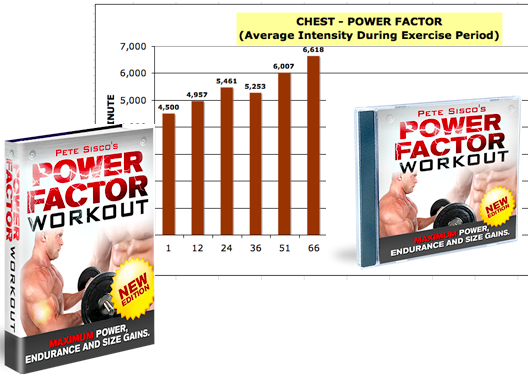 The Power Factor Workout spreadsheet shows your Power Factor and Power Index graphs for every major muscle group – automatically! The Power Factor Workout gives you sustainable workouts instead of the new fad of “boot camp” “insane” and “extreme” regimens that throw the kitchen sink into almost-daily workouts that get longer and longer as the weeks pass. Remember those three undisputed principles of strength and size gains? 1) high intensity, 2) progressive overload and 3) recovery before growth? Those principles don’t go away with every new fad workout. Also, these saturation workout plans are never sustainable. That’s because of the third principle – recovery must occur before you can build new muscle. The wrong way to train is to throw every exercise plus the kitchen sink into your workout in the blind hope some part of it will pay off. The Power Factor Workout is a plan you can literally use for the rest of your life in a strategic, measured and sustainable way. Training mistakes always lead to stalled progress and frustration. And changing exercises to ‘keep things fresh’ or jumping from strategy to strategy to ‘confuse your body’ is the weak advice of those who have no meaningful tools to help you make a plan and measure results. The #1 best motivation is to make progress! Meaningful measurement of your progress on each exercise provides its own motivation that makes you eagerly look forward to every workout and to return to the gym with new goals in hand – that’s the smart way to train. Look at that list! If that came in a pill it would be worth millions. Those are honest, scientifically validated benefits of productive strength training. In fact, the percentage of muscle a person has is used as a “biomarker of aging”. So having more muscle literally means you are a younger person, despite when your birthday is. If you want these health benefits then thePower Factor Workout is for you. I want you to be completely satisfied withPower Factor Workout and to have to most productive, power-building workouts you’ve ever experienced. And to remove all of your risk I want to make this guarantee: Try Power Factor Workout for 60 days – that should give you time to perform at least 10 workouts – and if you are not happy with the results for any reason whatsoever I will not only refund 100% of your money, I want you to keep Power Factor Workout and the bonus that comes with it. You’ll have all the knowledge it took me 15 years to acquire plus you’ll have the benefit of 60 days of training – and you’ll get 100% of your money back. My guarantee takes ALL of the risk away from you and places it ALL on me. If anything I am saying on this page (or in Power Factor Workout) is not true I would be at great risk. I am confident you will not want a refund of your money. Integrity: I am placing myself in the hands of the integrity of my customers and remain confident that, like all great human progress, the mutually beneficial exchange of value will serve us both in the long run. Every time you go to the gym, you’ll know exactly what to accomplish on every exercise in order to meet your goals. No guesswork. No going by “feel” or “instinct.” You’ll have your exact objectives in black and white. I. Proven Success: The Power Factor Workout has a very successful track record over almost two decades. 100,000+ regular folks have successfully used my training in 90 countries around the world. If you think about that you’ll realize it just doesn’t happen unless a training system honestly works. II. Math and Science: The Power Factor Workout is built upon a foundation of rational, tested principles, not gym lore and mythology. When I tell you something, it is a fact you can test and verify for yourself right in the gym. I use principles of math and physics, not the ‘no pain, no gain’ macho crap. And my premises have been tested countless times in gyms all over the world by guys like you. III. Works for You: Because the Power Factor Workout is based upon universally true principles, it works for men and women from total beginners to advanced trainees. So the workout will start working for you on your first trip to the gym. And it will keep on working because it is engineered to deliver progressive overload at the proper time your body needs it to trigger growth. IV. Best Exercises: You won’t waste your time with unproductive and unnecessary exercises. When I tell you a particular exercise is the best one for your triceps, quads or other muscles you’ll know it’s true, because I tested the overload per unit of time for dozens of exercises for each muscle group. So you’ll do the exercises with the most ‘bang for the buck’ every time. That means no wasted time or wasted effort on overtraining and insufficient recovery. V. Set New Records: The Power Factor Workout allows you to exercise in your strongest and safest range of motion. So, right from your first week, you be setting new personal records in every exercise. You will lift more weight than you ever believed you could. I guarantee it. I work with women who leg press over 1,000 pounds. Many men get over a ton. Your bench press weight will soon be more than double what you lift now in your injury-prone full range training. VI. Shorter Workouts: Even though these workouts are higher volume, the Power Factor Workout will very likely be briefer and more effective than whatever you’re doing now. Like to spend even more time in the gym? Fine, do some cardio on the treadmill or Lifecycle and burn off some extra calories. But don’t waste time and recovery resources lifting weights you don’t need to lift. VII. Fewer Workouts: The Power Factor Workout shows you a simple method to exactly monitor your recovery so your workouts will be spaced father apart so you avoid the chronic overtraining of other training methods. That means fewer trips to the gym and more time for the things you enjoy more. VIII. It’s Fresh: You’ll have a lot of fun and positive feedback with the Power Factor Workout. You’ll lift more weight, not be as tired and exercise will actually be something you look forward to. IX. Motivation: Repeated and continued success in the gym is the most motivating thing in the world. You’ll eagerly anticipate every workout and you’ll have a clear, specific goal for each exercise. You’ll see what I mean the first time your last bench press used a weight in the high 200’s and your goal for this workout is in the 300+. The same goes for every other exercise; improvement equals motivation. X. Value: The Power Factor Workout costs less than one session with a personal trainer, less than one month’s gym membership, less than one bottle of nutritional supplements. Yet it contains the exact knowledge that you need now to ensure your success in the gym. And this knowledge has no expiry date. XI. Get it Now: The Power Factor Workout is an e-book, spreadsheet and audio seminar you can download and be using two minutes from now. So no matter what corner of the world you live in, you can get the knowledge you need to make today’s workout the most productive workout you’ve ever experienced. XII. Zero Risk: I am taking 100% of the risk, not you. If you don’t like the Power Factor Workout for any reason you can request your money back within 60 days. That’s enough time to perform about 10 workouts to test the truth of what I’m telling you. And the reality is, because it’s an e-book, you end up keeping it even if you ask for a refund. So absolutely all the risk is mine. I just can’t think of anything that would be fairer to you and put the financial risk and burden of proof 100% on me. The Complete Power Factor Workout – Maximum Power, Endurance and Size Gains edition. 1. Use your credit card to buy the Power Factor Workout. 2. You’ll immediately be sent to a page where you can download the Power Factor Workout e-book, spreadsheet and audio seminar. The e-book will be in your computer where you can access and read it anytime you want. Technical stuff: This is an e-book. There is no paper and nothing gets sent to you by the Post Office. You read this book right from your computer after you download it. You need to have Adobe Acrobat®. This is a free e-book reading program available at www.adobe.com You also need the ability to use an Excel spreadsheet. You’ve read my iron-clad guarantee and the truth is: You have nothing to lose and strength and better health to gain. I just want the e-book and bonus audio seminar for $17 and I’ll do my own tracking and engineering. P.S. I created a terrific bonus for this offer. You will also receive thePower Factor Workout Audio Seminar to download free with your Power Factor Workout e-book purchase. This seminar is loaded with information about training and you can play it on your computer, iPod or other mp3 player. You can be listening to all of the information in the Power Factor Workout Audio Seminar five minutes from now. 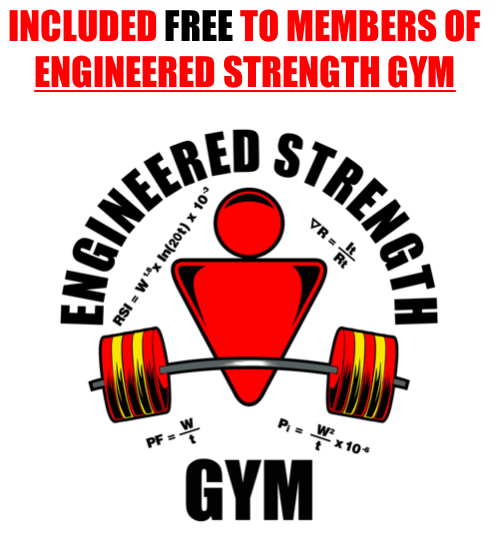 Power Factor Workout: Maximum Power, Endurance and Size Gains edition!